Last month, Mitt Romney held a $50,000 a plate lunch with major donors in Houston. What does a $50,000 lunch buy you besides steak and shrimp? Well, according to a new report from the New York Times, it’ll buy you the presidential contender’s ear. And a lot of folks from the energy industry are eager for that opportunity. During the event, “Mr. Romney solicited advice on energy policy from scores of oil and gas executives,” according to the paper. 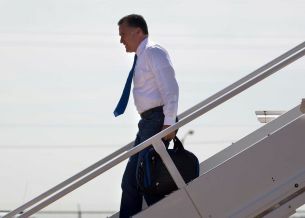 Romney shared the spotlight with billionaire Oklahoma City oil driller Harold Hamm, who is advising the presidential campaign on energy issues, according to the Houston Chronicle. Romney committed to “opening up [fossil fuel] markets in a much more aggressive way,” if elected. According to the New York Times special investigation, the fossil fuel industry is having an outsized influence on this presidential campaign season. More than $153 million has already been poured into ads criticizing President Obama’s energy policies and advocating for increased oil and gas drilling, mostly in swing states like Ohio, Virginia and Pennsylvania. That is four times the number of ads produced by entities promoting clean energy solutions. The American Petroleum Institute alone has spent $37 million on television ads, according to the paper. Meanwhile, the imbalance carries over to campaign contributions as well. NYT reports the Romney campaign has benefited from some $13 million in campaign cash from the fossil fuel industry, while Obama has received less than $950,000. Clean energy sources have donated just $78,000 to the Obama campaign, the paper reports.